Comfort Control is one of the Austin areas leading HVAC and Electrical Contractor companies. Based in Dripping Springs, Texas, they serve both residential and commercial customers with high quality HVAC repair and electrical services. As a means of increasing their new lead flow, Comfort Control engaged WSI to optimize their web site for 5 primary keywords. The first step in this project was on-page optimization involving the creation of 4 new SEO landing pages. The 4 pages were implemented on the site by the end of February, and in March we moved into the off-page optimization phase. 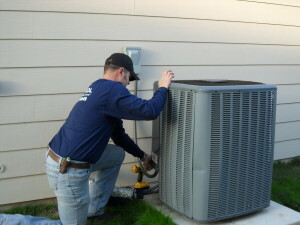 This phase involves the creation of unique original content about the types of services that they provide such as air conditioning installation, heating system repair, residential and commercial electrical wiring. This content will then be posted on company specific blogs on WordPress, Blogger, Tumblr, and the company’s Google+ page. These blogs will help build page authority for the new SEO pages by linking to them. At the conclusion of the off-page part of the program, we expect Comfort Control will have a steady flow of new leads from searchers looking for a top-notch HVAC service company.